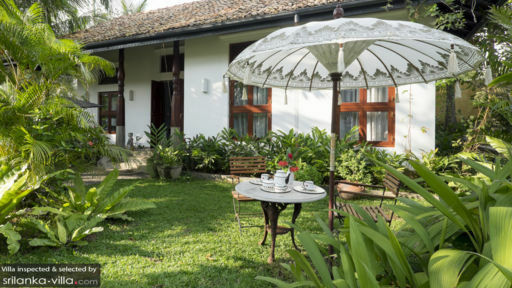 Named after the official flower of Sri Lanka, Villa Nelum is a tastefully decorated one bedroom villa in a garden setting just a few steps away from the ocean. A serene location with all the comforts of modern luxury. 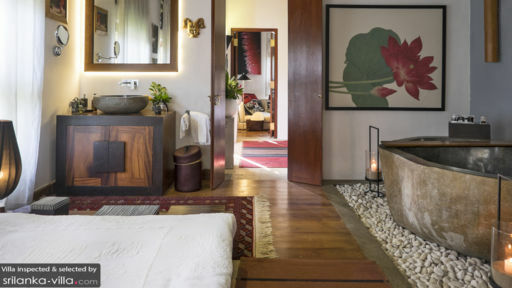 The centerpiece of Villa Nelum is its bedroom with a low slung queen sized bed and an exquisite bathtub carved out of a solid block of marble, how much more luxurious can it get? Step out of Villa Nelum and step into a lush tropical garden with soft green grass under your feet, an ideal spot for breakfast just on your doorstep. Villa Nelum has a cosy living room with tall bay windows and a large sofa with soft cushions for you to sink into with a good book. And if you need an extra bed, the sofa converts into a comfortable bed providing you with a second bedroom. As a part of the Earaliya Villas and Gardens, you will find that luxury is not something that is done imperfectly. 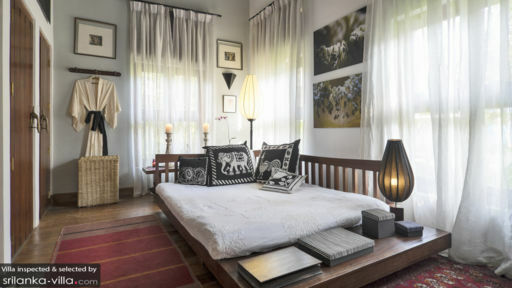 Comfort is the key word for the staff at Villa Nelum and they will do provide you with all the requisite services and amenities to make your stay as comfortable as possible. A short walk away from Villa Nelum is the Weligama beach, famous for its surfing friendly waves, Weligama is one of the many quaint little beach villages in the southern coast of Sri Lanka. Only about 45 minutes of the UNESCO World Heritage site of Galle and about 2 hours from the commercial capital of Colombo, Villa Nelum is perfectly located for an idyllic beach holiday. Eraeliya Villas and Gardens is a small boutique hotel set upon a palm tree lined hilltop over looking the surf in Weligama. An oasis amongst a fast moving pace of a traditional fishing village. We stayed in Villa Nellum set in our own private gardens. The bath tub was a very luxurious and welcome addition after long days travelling or surfing. Breakfast is served each morning, complimentary to your villa with a big range of choice western or Sri Lankan. We had some special lunches served on the hill top or by the pool. The food within the villas was delicious and affordable. My favourite was the tuna Ambultiyal .Beetroot long grain rice - red bean mix combo. Served with spring onion shredded coconut lime zest chilli un ripe tomatoes side. The staff were friendly, efficient and always welcoming. Perfect for couples, families and groups. I look forward to my next trip in season when the surf pumps at Jungle beach. We really loved the Eraeliya Villas resort. Everything about the place exudes elegance and taste without being garish. The accommodation is in private villas and apartments dotted about the grounds and you never really feel you are in a hotel. Dining is also private and you eat all meals on your terrace or balcony. We enjoyed the fact that meals were a la carte, although the menu was only loosely based on what you would actually receive when you ordered, especially the breakfast menu which sometimes bore absolutely no resemblance to what the chef would prepare! For example, "poached eggs with spinach and hollandaise" would arrive as poached eggs with bacon and sausage! I think menu consistency needs to be improved, but this is not something which we felt we wanted to knock off a star for. The location is just perfect, with a stretch of (almost) private beach a few steps down. The sea can be rough with cross currents so be careful when swimming and extremely cautious when snorkelling. We stayed in the very cute Muhudu Bella villa with a unique snail shaped bathroom and. We felt this was the nicest villa of the bunch as it was the most romantic and secluded and had a Maldivian charm about it. The bathroom was lovely with a spacious shower area but is in dire need of more lighting. At night you practically shower in the dark. Service was very good, with all staff being very polite, friendly and helpful at all times. Overall a gorgeous place for a tranquil getaway in Sri Lanka.